In this newly updated eLearning course, you’ll be given a solid introduction to toxicology by expert Laura Robinson. The course is designed to be as engaging as it is informative, using a rich mix of content types and representing exceptional value for money. 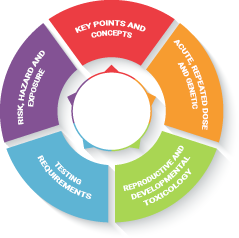 Why do you need to understand Toxicology? Toxicology is the study of adverse effects of chemicals on living organisms, more specifically, how chemicals can cause harm to humans. Understanding the potential hazards and risks of using chemicals in both daily and work life is a key component to keeping yourself and others around you safe. This course provides you with the knowledge to recognise the ways in which chemicals may interact with living organisms and the precautionary measures which are needed to prevent harm to humans. This is achieved via a series of 17 modules filled with up-to-date regulatory data, using over 500 professionally-designed pages of content combined with 295 audio explanations and 90 videos, module-specific quiz questions, an extensive glossary of terms and supplementary module handouts to aid your learning. The first edition of this course focused specifically on REACH regulation; in response to trainees’ feedback, we have now rewritten the content to provide more clarity on a global scale.